Stats: 14 lbs. 2 oz., 23 1/2 in. Scientific guess. We call you… : Francie. Franny Belle. Bean. 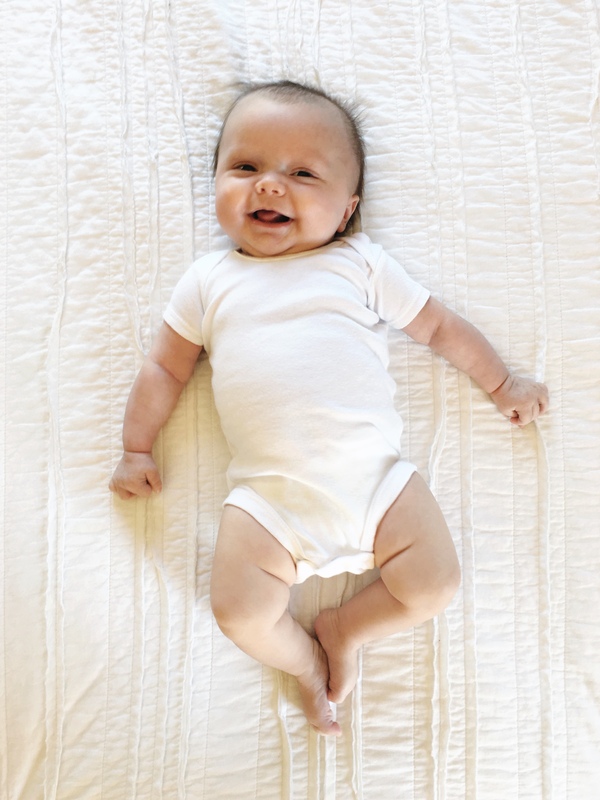 Clothes: We’re still in 3 month clothes, but closer to the 3-6 month version rather than the 0-3 month. You graduated to size 2 diapers. I almost never put a headband on you, which has caused you to be mistaken for a boy numerous times recently. I attribute that to your hair loss! Sleep: During the day, you’re kind of cat napping. Thirty minutes here, 10 minutes there. At night, though, you’re sleeping in your crib for 11 hours straight. STRAIGHT. Don’t ever change, Frances. Favorites: Eating. Constantly. You’re also fond of sitting up, your play mat and chewing on momma’s hand. – You are drooling like crazy. I see teeth in our near future. – I was telling your daddy last night that I was a little worried about your development (meaning, you rarely pull your big noggin off the floor during tummy time). You decided at that moment to roll over from your belly to your back… twice. You’re always making me a liar, Frances. – You have daddy’s eyes and momma’s cheeks. We think you might also have a serious widow’s peak. – We swaddle you at night. When you wake up in the morning, and we unwrap you, you always give us the BIGGEST stretch. Arms over your head, feet straight out, and a giant smile on your face. It’s the cutest thing we’ve ever seen. – You’re so happy. It’s rare when you cry, and you still just go with the flow. Not much phases you – not even your loud big sister!